The federal government will not provide 10 years of 100 percent support for a Maine Medicaid expansion, but it will still provide most of the money. AUGUSTA – The federal government cannot grant Gov. Paul LePage’s request for 10 years of full funding for an expansion of Medicaid in Maine, says the agency that administers the program. The Centers for Medicare and Medicaid Services delivered the message to the LePage administration in a letter on May 24. The decision wasn’t unexpected, but it revived the heated debate among state lawmakers and Le- Page over whether Maine should extend benefits to 60,000 more low-income residents. The federal government has given several states flexibility for their participation in Medicaid expansion under the Affordable Care Act, but no state has secured a deal to fully fund expansion for a decade. Medicaid, which operates in Maine as MaineCare, is a federal health insurance program that is jointly administered and funded with the states. Its complex eligibility and reimbursement rules enable critics and supporters alike to seize on numbers that make their case. That’s what happened at the State House on Thursday. Democrats, who are pushing to expand Medicaid, said the letter confirmed that the LePage administration’s offer to expand was disingenuous, since it was predicated on the 10-year, 100 percent funding commitment from the federal government. 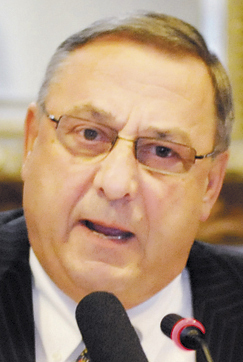 The LePage administration countered that Maine wouldn’t get the same deal as other states because it voluntarily expanded its Medicaid program several years ago. “Once again, the federal government has failed to come through for Maine,” LePage said in a prepared statement. The governor had asked for 100 percent reimbursement for all populations covered by the expansion. The federal government now pays 62 percent to cover about 10,500 Maine adults without children, and would likely increase reimbursement to 100 percent from 2014 to 2016 before gradually dropping to 90 percent, according to the letter from the Center for Medicaid Services. Maine also would receive 100 percent funding to cover about 50,000 additional childless adults under Medicaid expansion. Maine already provides Medicaid to about 15,000 non-disabled parents, as defined in the federal health care law. According to the Centers for Medicare and Medicaid Services, the state would continue to receive its current matching rate of 62 percent. Expansion isn’t expected to add parents, but it would prevent the 15,000 parents from losing coverage on Jan. 1 because of changes enacted by the Legislature last year. The LePage administration said it would cost the state $31 million in the next two years to pay for all insured, able-bodied parents, a group estimated to number 41,000. Not everyone in that group would be affected by Medicaid expansion, and the Department of Health and Human Services has already budgeted for the population that would. Adrienne Bennett, LePage’s spokeswoman, said Democrats are spinning the agency’s letter to focus on the people who would gain coverage through expansion but ignoring flaws in the program and the 3,100 developmentally disabled residents who qualified for coverage but are now on a waiting list. Bennett also echoed Health and Human Services Commissioner Mary Mayhew, who has said frequently that Maine needs more control over its Medicaid program to control costs. The state recently won a $33 million Medicaid innovation grant from the federal government. Cindy Mann, the federal agency’s director, said in her letter to the administration that the agency will continue to support future health care reform efforts. The administration said Thursday that more are needed. Jodi Quintero, a spokeswoman for Eves, the House speaker, said the administration “grossly misrepresented” the letter from the federal government by focusing on a reimbursement rate for non-disabled parents that was never in dispute because they would not be affected by expansion. “They’re moving the goalposts,” said Quintero, adding that the group of parents will be paid for in the state’s two-year budget. Also Thursday, the Legislature’s Health and Human Services Committee voted 10-4 to pass L.D. 1066, a Medicaid expansion bill sponsored by Rep. Linda Sanborn, D-Gorham. One Republican, Rep. Carol A. McElwee of Caribou, voted with the Democratic majority. The bill could move to the House for a vote next week.